It seems such a long time ago now – pre-winter – before temperatures were all prefaced by a minus sign and we kept the beer in the fridge rather than the microwave. In fact, it’s been a while since I reported on anything in the world of inclusive cycling, but I seem to be getting back into the saddle now, so on with the snow show! It has to be said, we didn’t have a great attendance for this meet in Brum, but despite that, we still had a great meet. I got the timing about right too – no racing back from the ride to turn up late for the meeting this time! The canal towpath out of the centre was challenging in places. I think it would have taken a great deal of control to remain upright on a standard trike, what with the severe camber on some of the bends approaching the bridges and locks. But with no trikes present we only had to deal with the barriers – irritating but negotiable with a RADAR key along the section we rode. With a prosthesis that has all the nautical characteristics of an anchor, I’m not overly keen on proximity to water. Max Burt assured me back in the summer monsoon that canals are only about 4 feet deep, having fallen in one himself, and based on that I made it without fretting too much to Edgebaston Resevoir, where there was always a decent stretch of land or a wall between me and the wet stuff. 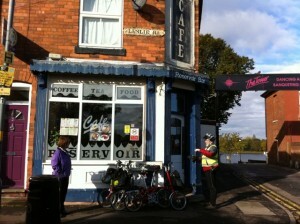 I can recommend the Resevoir Cafe. It operates as a Chinese Takeaway in the evenings, but breakfasts, sarnies, cakes and HP sauce are all served to authentic Birmingham standards during the day. It was clearly popular with the locals. Back at the Central Library it was business, tea and biccies for the AGM. We had a surprise visit from CTC’s Steve Bailey. Steve heads up the Cycle Champions who deliver inclusive cycling projects across the country. Apart from putting a face to the name we also laid some foundations for collaborating in the future. Starting with an update of the cycling centres on our Places page. Caroline arrived by train and trike from Sheffield armed with Walnut Whips for all, fully justifying her new role as ICF Welfare Officer. Jim came by coach and Brompton from London with a blank ledger and a brand new bank account – soon to be filled we hope. Along with Nobby, Brigitte and yours truly we elected the committee, reviewed the year and topped up with coffee and choccies before settling down to the presentation from our speaker Beccy Marston. Beccy is the Cycle Champion for Wolverhampton and what a busy champion she is! On the inclusive cycling front the project’s highlight of the year was cycling the Wolverhampton Half Marathon. Comprising of riders from West Park Stroke Group, F2BU Disability group, Stow Health Day Centre Cycle Club and Mallow Court cycle group, which supports residents with mental health issues, everyone completed the event in around the 2 hour mark. A major achievement for all involved and a great example of what can be done. Thanks to Beccy for a great presentation and to Steve for making contact. Til the next time. 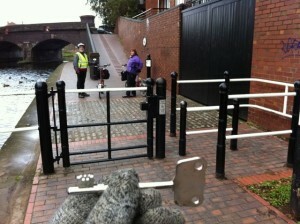 This entry was posted in Inclusive Cycling Forum and tagged bikes, birmingham, disability, meeting, words on Thu 9 Dec 2010 by kevin hickman.